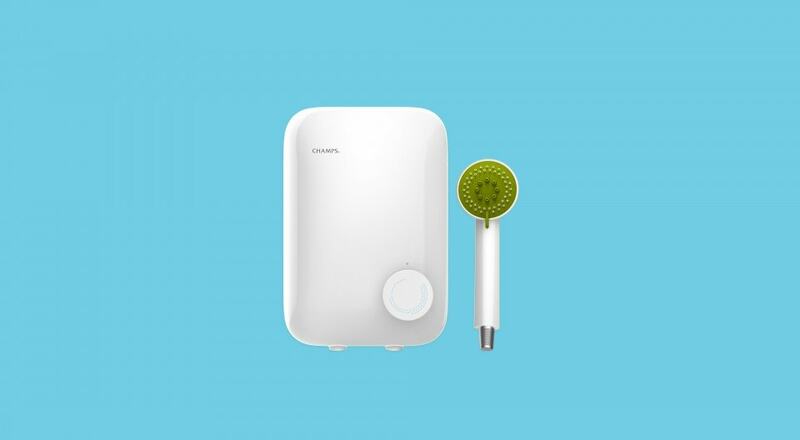 “Basic+” was the philosophy we created to rejuvenate and modernise Champs, a homegrown water heater brand owned by retailer Cheong Hock Guan. Champs produces affordable products out of quality components by passing on cost-savings from marketing and logistics to consumers. Similarly, our new product line for Champs and its branding system is designed to deliver this message in an economical fashion too. We were commissioned by Champs to upgrade their image to better resonate with new homeowners. This modern rejuvenation started with the product design of 3 heaters as the anchoring series for their line of products. To leverage on existing sales trends, two of these were contemporary updates to their bestseller models. One challenge was to create sufficient frontal variation even though the back shell has to be kept consistent for more economical tooling; another key hurdle was to create fresh and contemporary graphics to represent temperature and water flow. Instead of focusing on Champs’ price competitiveness, we worked with the company to identify their target audience as buyers who are seeking no-frills products, which is typically a younger market group. 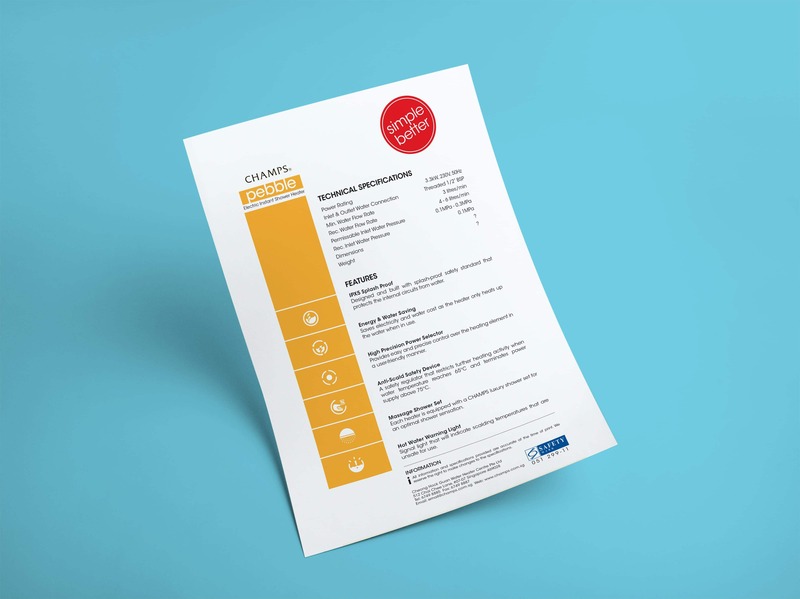 This led to the creation of the “Simple Better” slogan which is represented as an award sticker – an approach mimicking sales stickers which retailers sometimes place on products to help focus the customers’ attention and to reduce choice overload. The new logo design retained and refined the most recognisable aspects of the original logo while cleaning away excessive elements. 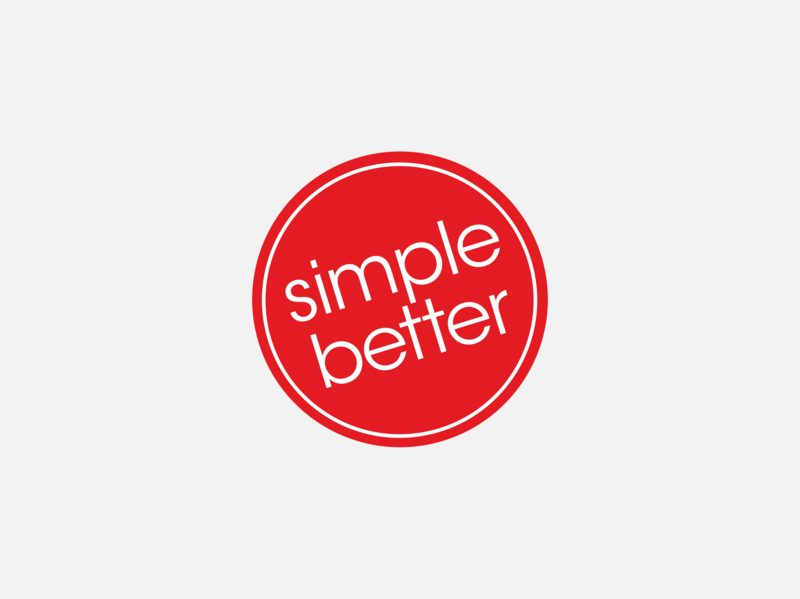 This decluttered the logo in line with the overall brand strategy of “Simple Better”. The redesigned Champs packaging features only an image of the product to signal the brand’s singular focus, stripped off any fluff. This visual is computer-rendered to do away with the need to spend on product photography too. Champ’s packaging and collaterals are designed to demonstrate the good qualities of being simple. The packaging utilises a singular colour block system to be easily identifiable in-stores, with the various views optimised for visibility amidst competitor products. The collaterals are also designed so that buyers can easily stack and compare against the different heaters when selecting.